Confessions of the Chromosomally Enhanced: Mic-Key Button! Yesterday, we spent nearly all day at the hospital and while we'd rather not be there, it was kind of refreshing to be there for clinic appointments instead of being admitted. Josie kicked off the day by having an echo cardiogram and seeing the cardiologist. It turns out that her heart is doing great! Woo Hoo! We also saw Josie' pulmonologist. While her lungs certainly aren't healthy, he is optimistic that they will improve with time. Let's pray that he's right! I was kicking myself because I forgot my camera so you'll have to tolerate these icky cell phone photos. 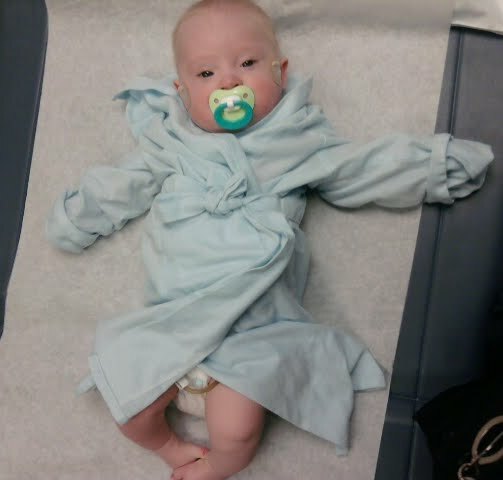 They gave Josie this snazzy robe to wear. Talk about a trend setter! Cool, huh? If anyone has any Mic-Key button tips (especially advice on how to prevent it from popping out - ewww!) please feel free to leave a comment. De-lurking to give you a few g-tube tips. :) My name is Rachel, btw, and my sweetie with DS is 3 years old and has had a g-tube for almost a year. The only real worry you have with the g-tube coming out is it getting pulled out. Not sure if Josie has the coordination to grab it yet but if she does you can either have her wear onesies underneath her clothing to keep her from getting to it. Or, you can put some tape over the button to keep it in place. 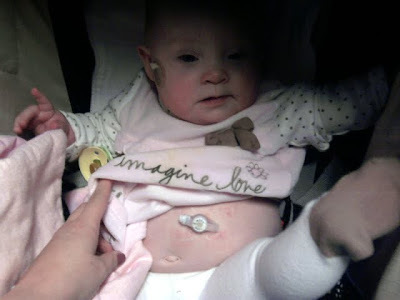 Personally, the only time we've had the button come out was when Sunshine was attached to the feeding pump and I was trying to carry her somewhere - and the tubing from the bag got caught and pulled on the button. The best way to avoid this is to secure the extension set to her stomach with tape. This keeps it from moving around which helps with granulation tissue and also helps secure the button so the feeding line doesn't pull on it. Good luck with your g-tube Josie! Sunshine has done wonderfully with hers and is so healthy now. I hope the same happens for you! Wow, impressed that she barely cried. That was the one procedure that made Addison more upset than anything else that she has gone through. I used to get nervous about her Mic-Key popping out esp when other people were watching her, so I got to the point where I taped it down with paper tape. It wasn't too hard on her skin when I needed to pull it up and access the spot, but firm enough to keep it from swirling around or getting caught on things. Welcome to the Mic-Key club, Josie! We're over 3 years in, and we're happy to share any tips we can. At your age, we were all about onesies ALL the time, especially the kind that snapped all the way down the front, though they're harder to find. The other best tip we can share is to use a split 2x2 gauze around the tube if there's any redness that's noticed. Just don't tape it to the belly, JUST to itself. 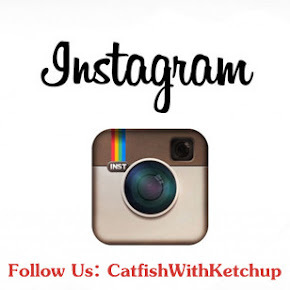 We're happy to share more details and even pics if you would like... saved lots of probs once we figured that one out! Enjoy your new cute accessory. We are firm believers that the coolest kids have them! I wish I had great mickey button advice, but my munchkin can't grab, although he rubs down there when he's naked. Naughty boy. You just need 4 arms to keep those grabby hands away! Glad the Mic-key button went well, what a trooper she is! Hoping her lungs clear up soon! We will jump on the onesie band wagon as well.So,at almost 4,and tiny,Zoey still wears one under her clothes.Especially when at school.Nervous everyone else won't be as gentle and pay attention to it as we do.We have never had it pop out and she had never pulled it out ... not for the lack of trying,we have just gotten there in time before the deed was done.2x2 splits are great if it is red.Plain old Desitin,the original,has been a great go to cream for redness as well.We change hers out at home every 4 months or so and now it is just second nature to us and her. Welcome to the club.not such a bad one to belong to,especially for meds and when they are not feeling well and you can regulate hydration and food. Good luck and as always,Josie and Leanne,are amazing. One tip we have (from experience) is to always, always, always put a button immediately back in the stoma if one does fall out. EVEN IF IT'S THE BROKEN BUTTON. Just band aid it back in the stoma until you can get the replacement button in. You might also want to sleep Josie-O in pj's that are snug enough to hold the button in place, should the balloon pop overnight. That happened to us once and, by the time we'd discovered button-less LC the next morning, the stoma had already shrunk and we had to spend the next 8 hours in an ER waiting room to get the stoma re-dilated. Not good times. Way to go, team! You look like a star, Josie O. You already have all of the advice I would have given! I agree with RK, onesies that snap all the way up are the best! Addy pulls on her button all of the time and has only pulled it out once and that's because there was a leak in the balloon anyway! The Skink was a mega-mic-key remover. I put so many back in it just became second nature. We used to lube them up with Pam cooking spray to make insertion a little easier.